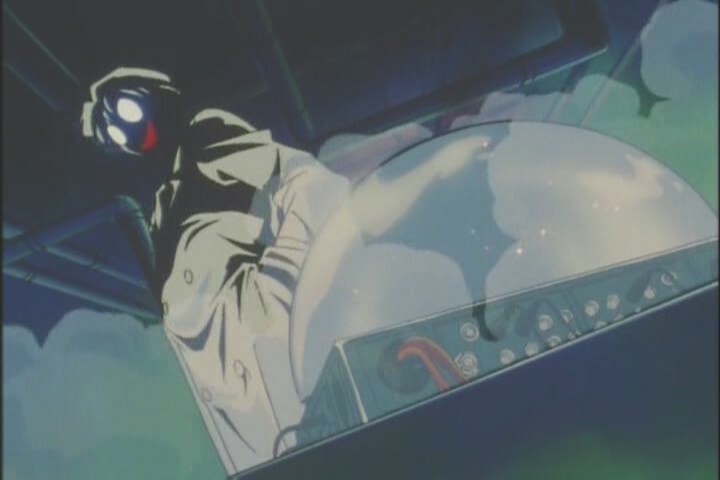 This is the fourth in a multi-part retrospective blog on Sailor Moon S. Today we discuss the final phase of the series, with Hotaru’s descent into possession, the Senshi’s investigation of Mugen Academy, and the big finale. Today’s post will focus on the final phase of Sailor Moon S, beginning with the introduction of Telulu (and death of Telulu – nice job) and ending with Chibi-Moon deciding to stay in the 20th Century a little longer. So, for like another series then. And another dozen episodes after that. The final phase in Sailor Moon S is the shortest, at 7 episodes, but as a final arc it’s the most complex and interesting of all seasons of Sailor Moon thus far. It wraps up not only the on-going story threads throughout the series, but also brings the underlying philosophical conflict to a boil in the climax. The ending of Sailor Moon S begins by removing any routine they’ve set up. No more monsters-of-the-day, no more interesting by misunderstood victim that hangs around for one episode, they jump right in, subvert your expectations and they keep ramping up the tension episode by episode. If there was a word to describe episodes 32-36, it would be “ominous”. The episodes are structured to introduce increased threat to Hotaru, while dangling a possibility of her freedom, making it all the more tragic as she continues to fall further under the spell of Mistress Nine. It makes for compelling viewing over the arcing narrative, more so than Hotaru visiting a rose garden or playing cards. With the absence of Daimohns, the final three (four) members of the Witches 5 steps in, and they’re essentially turned into monsters of the week. Well we can’t get away from too much routine can we? I’m not sure this works. It does create more threat, with deaths creeping in almost to the point of expectation, but it also reduces how the viewer perceives the Witches 5 and the Death Busters. They just don’t seem as competent as you’d like. Throw on that the final 3 witches are by far more interesting than Mimett and you’ve got something akin to resentment at seeing them off’d so soon. It’s definitely not a deal-breaker however. Though I wonder what could have been, I’m satisfied with the break from routine, the surprising developments that happen every episode. Best of all, I love the sense that the Senshi are actively investigating their enemies. They’re proactive, they’re close to the action. Makes so much more sense than the usual passive role they take, which is why Episode 33 and Episode 34 manage to remain compelling and enjoyable, despite the massive exciting climax afterwards threatening to overshadow everything else. We start the phase with that conflict being stated outright. 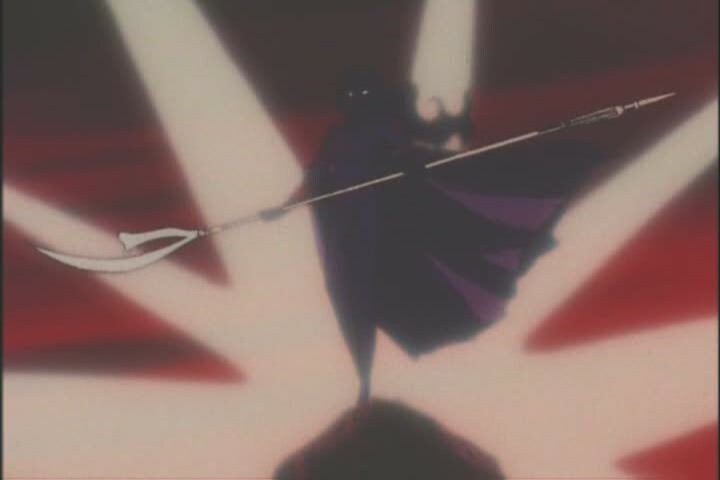 While the Outer Senshi were largely ignored in Phase 3, it’s clear that the rift between the groups has grown wider with the Outer Senshi’s intention to kill Hotaru if they get the chance, identifying her as not only an agent of the Death Busters, but, more importantly, Sailor Saturn, destined to end existence with her awakening. 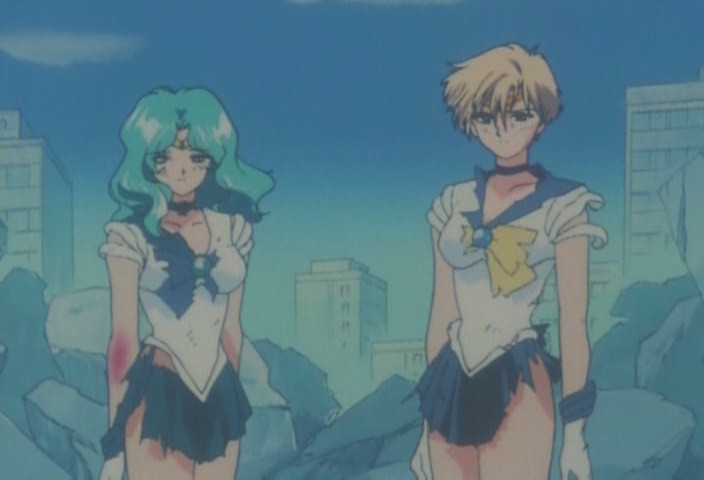 The Outer Senshi’s decision to kill Hotaru, an innocent girl, is not made lightly. From all we know of the Outer Senshi, they value life as much as Sailor Moon does, perhaps even more because they understand the cost, and know why it’s worth sacrifice. I’ve always admired the way in which they’ve built the characters of Michiru and Haruka over the series. These characters have always gone to any length to ensure the safety of the planet, but were they cold robotic utilitarians, they would be unsympathetic. 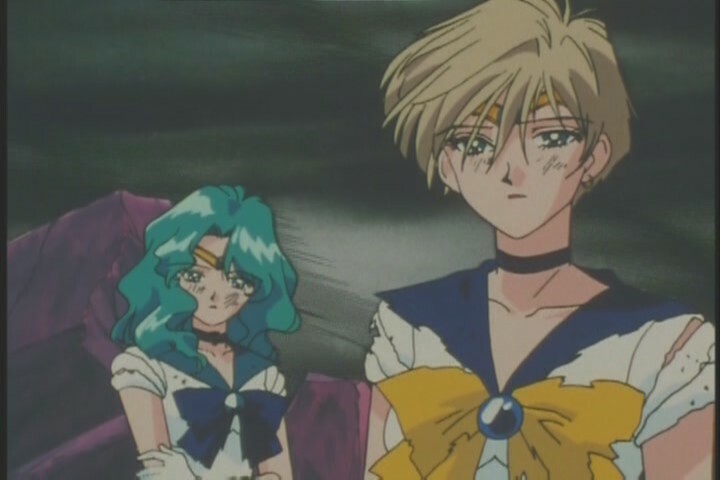 Instead, we frequently see what their ethical stance does to them emotionally, as with when it was suggested that Makoto or Usagi held a Talisman. 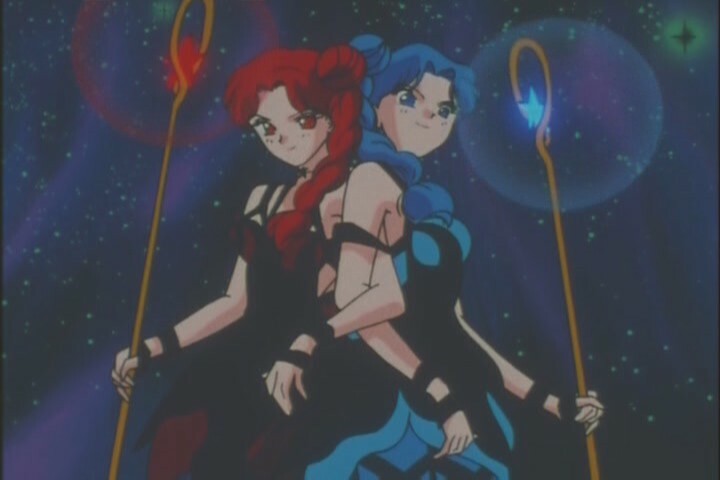 The Inner Senshi abhor their methods of course, but as an audience member, we can sympathise, or even perhaps agree with, the internal machinations of Haruka and Michiru. This makes the climax of Sailor Moon S incredibly compelling, as you both understand and abhor the actions of both Sailor Moon and the Outer Senshi. Sailor Moon chooses to hand the Grail over to Mistress Nine in the belief that she can still save Hotaru, while Uranus and Neptune are still determined to kill her, despite the sacrifice, because it will save the world. It’s a clever balance they strike, one that makes you love, rue and understand both sides. 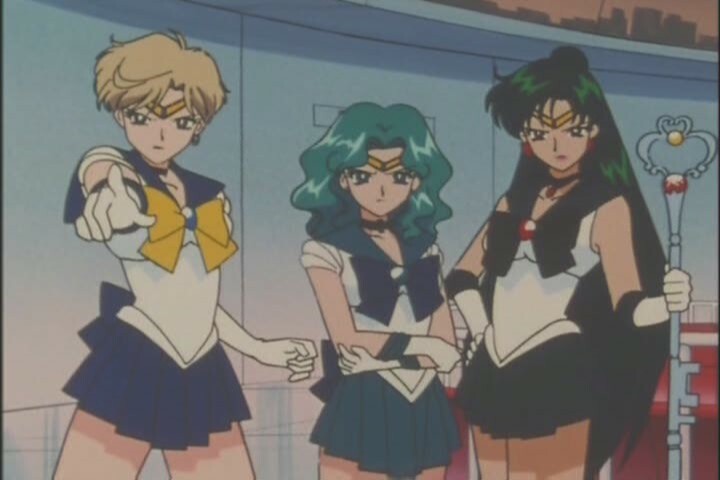 I’ve discussed exactly what makes the Outer Senshi so brilliant so many times this season, but I will say that seeing them go was rather painful, knowing that it’s a season before they return, and that the majority of their character arcs are done for with Sailor Moon S.
Guys, have I told you how much I love Sailor Saturn? They teased her all series, built up her lore, her threat, her danger. We don’t get to see much of her in the end, but my god it’s satisfying. The mere existence of her character expands the lore of Sailor Senshi by some margin. When was Sailor Saturn created? Why was she given the power to destroy the world? Was she awake in the Silver Millenium? 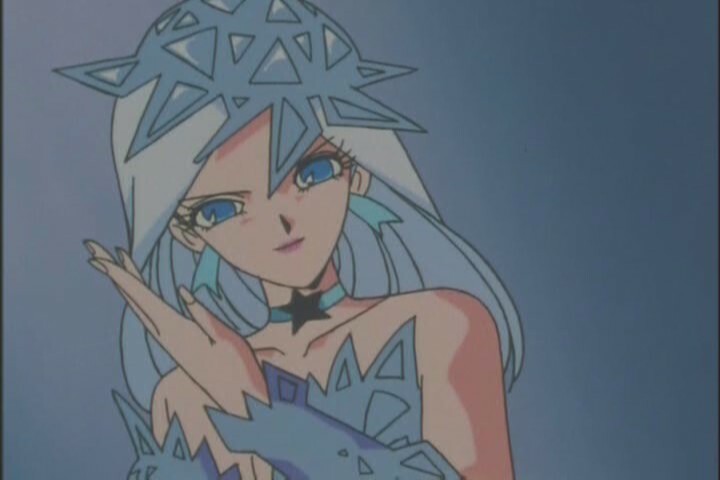 Does she exist in Crystal Tokyo in the 30th Century? How? When? Why? Where? Who? 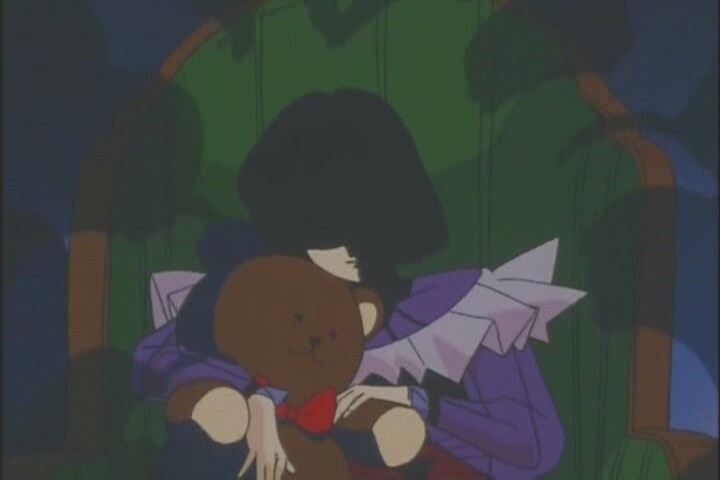 The series leaves so much open for explanation over Sailor Saturn… and I’m just fine with that. Saturn’s biggest asset is her rarity, her uniqueness, her obliqueness. her impenetrability. Sailor Pluto may be mysterious, but Sailor Saturn takes it to another degree altogether. She also earns her appearance. Hotaru goes through absolute hell before finally managing to break through Mistress Nine, in one of the most dramatic moments in all of Sailor Moon. That she then has so little time left, sacrificing herself to destroy Pharaoh 90, is a strange cruelty for a life so already mired in pain. It’s well done, with the right amount of pathos, so that you’re enormously empathetic towards Hotaru and Saturn without it becoming maudlin. 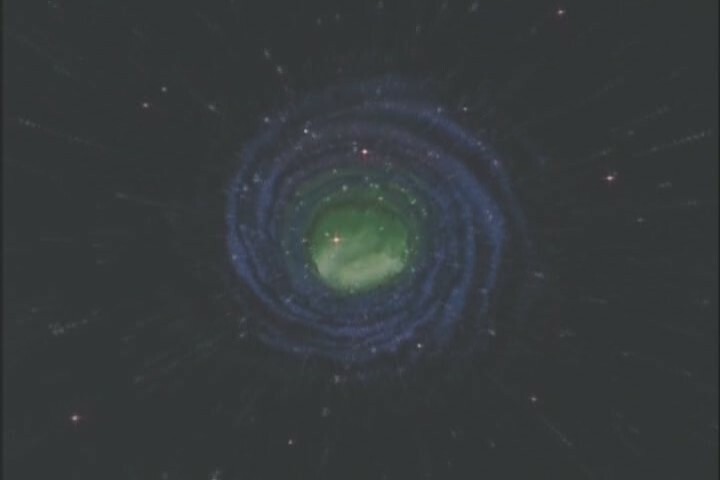 One of my favourite moments of any episode of Sailor Moon is when Hotaru finally breaks through Mistress Nine, and she dissolves into nothing, leaving behind only the symbol of Saturn. Still sends chills down my spine. 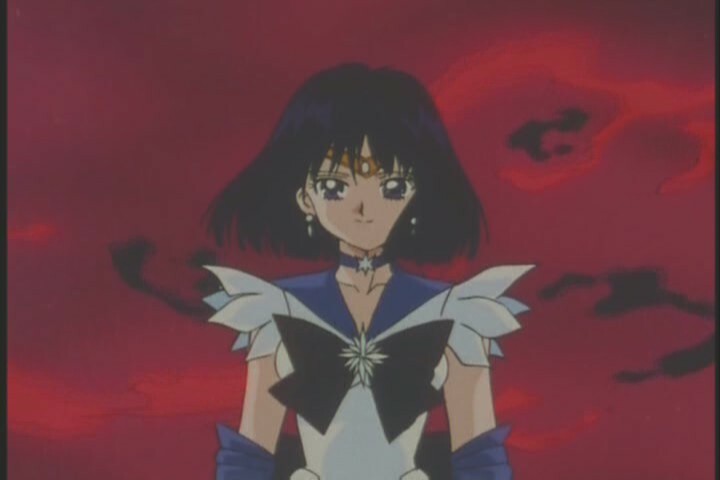 I love Sailor Saturn’s design. It screams volumes about her personality and individuality from the rest of the Senshi. The shoulders, the dark hues, the boots, and especially the crest on her front in the shape of a Pure Heart, everything is seemingly perfect for her role and character. And, of course, that scythe. That goddamn beautiful Silence Glaive. What can I say? It’s the coolest damn design, in the hands of the coolest damn Senshi. 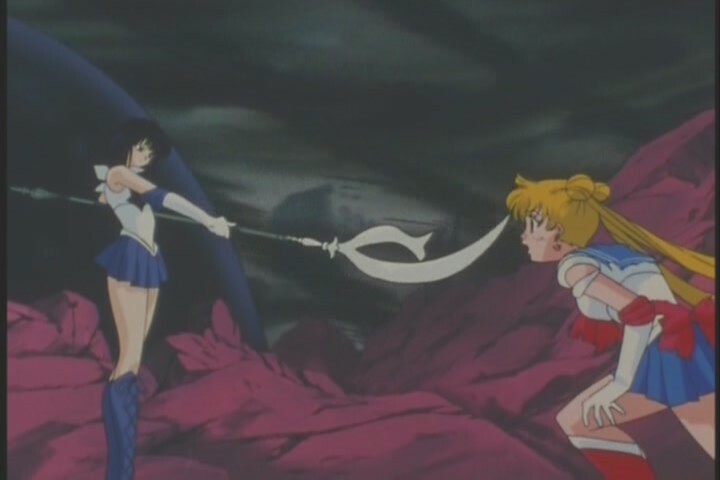 It’s the only weapon wielded by the Outer Senshi that actually looks threatening too – the Space Sword looks kind of like a toy most of the time. Even without the sycthe, Sailor Saturn would have been the coolest Senshi there is, but with it? She’s transcendent. She looks every bit the Dark Messiah that was promised. I adore the climax of Sailor Moon S. It’s been a admirable point this far in this show that, despite the long episode count, they still manage to escalate drama, tension, horror and relief every time. I’ve covered in minuscule detail every moment I’ve found spectacularly brilliant about this climax. Even better than the brilliant plot developments surrounding Mistress Nine, Professor Tomoe and Sailor Saturn, is how this climax fits as a conclusion to an already brilliant series. From the very first episode they built the threat of “the Silence” up, in plot, in tone and in design. This dark red light with a black swirling tornado has been used as a constant threat, an emblem of an ominous occurrence. 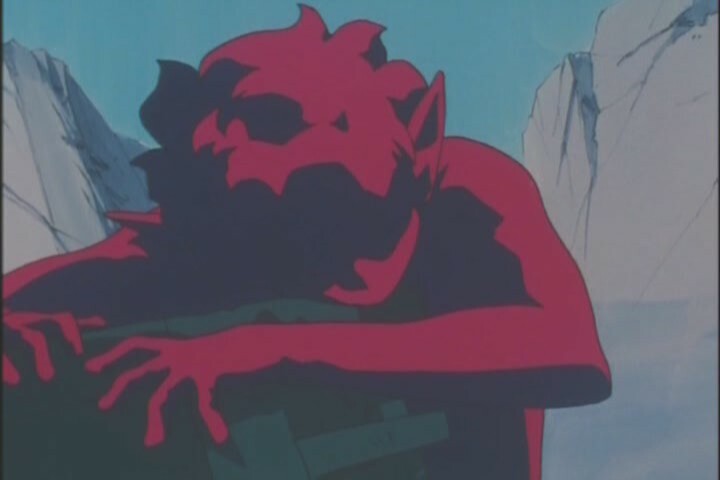 As the final episodes begin to show that vision becoming a reality, the foreshadowing becomes really, really effective, much in the way that Crystal Tokyo was in Sailor Moon R.
Pharaoh 90 doesn’t have a huge amount of screen time, or even a face or voice, but that only serves to make him the most threatening of all Sailor Moon bad guys. His introduction late in the game, in Episode 30, may have seemed a bit tardy, but I feel that it works. He’s veiled behind the scientific mysticism of the Death Busters, and the constant threat of the Messiah of Silence. When Pharaoh 90 makes his entrance, he’s so alien, so unknowable, so seemingly powerful that it’s like being in the malevolent gaze of a god. Which, considering all the the Christian allusions in this series makes complete sense. Sailor Moon ultimately being unable to give any resistance against this horrific enemy is a masterfully tense situation, and when you realise the ultimate conflict is not an energy-blast fight between good and evil, but a rather sad and wonderful frustration at the cruelty of sacrifice. 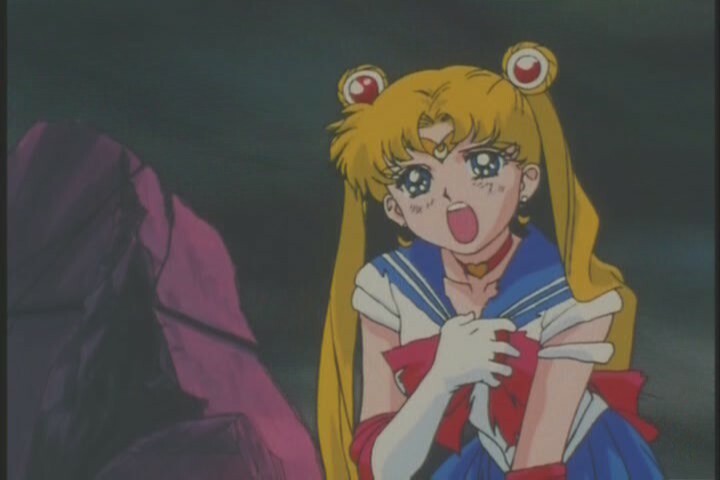 It’s the moment when you see Sailor Moon screaming and crying in pain, not at her own expense, but at the thought of Hotaru, Sailor Saturn, sacrificing herself, and what’s worse, choosing to do so, that you realise that Sailor Moon S is a fantastic piece of work, not just in this episode, but as an entire series. Great work, the result of 36 episodes of foreshadowing and plot development. There are no truly bad episodes in this phase, mainly because there are so few, but also because such an amazing climax requires a certain level of quality to be maintained. That’s not to say some episodes aren’t better than others, however. Episodes 34, 35 and 36 are all some of the best anime episodes of any show ever. Watch my hyperbole go! Episode 32 is kind of naff, being poorly animated, but with all the drama pumping up it’s still enjoyable. I like Episode 33. Seeing the Senshi actively investigating Mugen Academy, skulking around, gives them a good sense of initiative. Ami is also kinda cool in it, which is rare for our poor old buzz-kill Senshi. Episodes 37 and 38 definitely coast on the highs of the previous episodes, but they are immensely satisfying and leave Sailor Moon S wrapped-up nicely. In fact, these episodes do even more to get you excited for Sailor Moon Super S. As to whether this pays off, we shall see in a few weeks. Patience, dear reader. 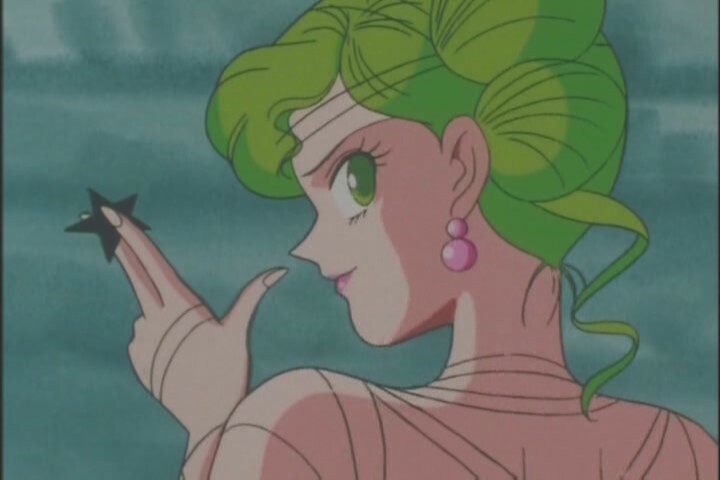 NEXT TIME: We wrap up the Sailor Moon S mega-retrospective with one final post: a listicle! I know the internets love numbers and things attached to those numbers in a seemingly arbitrary manner, so what am I if not popularist? YOU WILL HAVE NUMBERS, DEAR MOONIE. ALL OF THEM.